Opposition MPs say the Liberals have backtracked on a campaign promise. Suzanne Legault, Information Commissioner of Canada, holds a press conference the the National Press Theatre in Ottawa on June 8, 2017. OTTAWA — The federal information watchdog says she is "generally very disappointed" with a Liberal bill that would revise the law intended to give Canadians access to federal files. 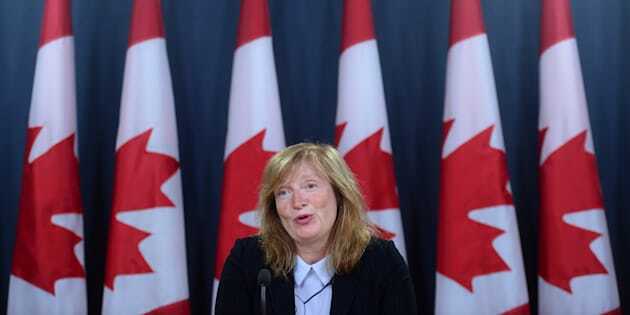 Information commissioner Suzanne Legault said Tuesday she will present a special report to Parliament this week outlining her concerns about planned changes to the Access to Information Act. It is the latest indication the bill, which has been criticized by opposition MPs and leading transparency advocates, will receive a rough reception when it arrives at a House of Commons committee. The access act, which took effect in 1983, allows people who pay $5 to request everything from correspondence and studies to expense reports and meeting minutes. Agencies must answer requests within 30 days or provide a good reason why more time is necessary. Many Canadians complain about lengthy delays in processing requests and blacked-out passages in the records that are eventually released. Government departments can black out requested records on grounds related to national security, legal privilege, policy advice, commercial secrets, federal-provincial relations and other areas. Records deemed to be federal cabinet secrets are completely off-limits for 20 years. In addition, dozens of agencies with federal ties fall outside the access act. Treasury Board President Scott Brison acknowledges the need for modernization, and he describes the government bill introduced in June as the first substantial revision of the act. The bill would give the information commissioner authority to order the release of records. The legislation also proposes extending the law — in a limited way — to the offices of the prime minister, cabinet members, senators, MPs and administrative institutions that support Parliament and the courts. These offices and institutions would not be required to answer access requests filed by individuals, which most agencies and departments must do. Instead, they would be legally bound to regularly release certain types of records, such as hospitality and travel expenses and contract information. Conservative and New Democrat MPs have criticized the Liberals for backpedalling on a campaign promise to fully apply the access law to ministerial offices. They also say the bill does nothing to narrow the exemptions in the law that allow federal agencies to keep information under lock and key. Others have raised concerns about a provision that would allow an agency to refuse to process a request unless the applicant states the type of record being sought, the subject matter and the time frame in which the documents were created. Legault has long advocated strengthening the access law, and made it clear at a conference Tuesday the legislation doesn't live up to her expectations. "Having carefully reviewed the bill, I am generally very disappointed with its content." — Loosen various restrictions that allow agencies to withhold information.